Hip Hop legends Layzie Bone of super rap group Bone Thugs, and Harmony, and fellow Mo Thugs artist Thin C give major props to the late Jack Herer who wrote the book “The Emperor Wears No Clothes.” If you are not familiar with Jack Herer I suggest you check out the video below this one. 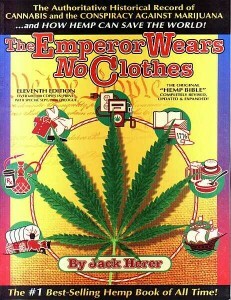 The Emperor Wears No Clothes is a book written by Jack Herer. Starting in 1973, Jack Herer took the advice of his friend “Captain” Ed Adair and began compiling tidbits of information about cannabis and its numerous uses. After a dozen years of collecting and compiling historical data, Herer first published his work as The Emperor Wears No Clothes in 1985. The eleventh edition was published in November 2000, and the book continues to be cited in cannabis rescheduling and re-legalization efforts. The title of the book alludes to the classic fairy tale “The Emperor’s New Clothes” by Hans Christian Andersen. Herer uses Andersen’s story as an allegory for the current prohibition of cannabis. European experts on hemp, like Dr. Hayo M.G. van der Werf author of the doctoral thesis Crop physiology of fibre hemp (1994), criticized the book for containing some inaccuracies.